Coral bleaching on the Great Barrier Reef last year was even worse than expected, while the full impact of the most recent event is yet to be determined. 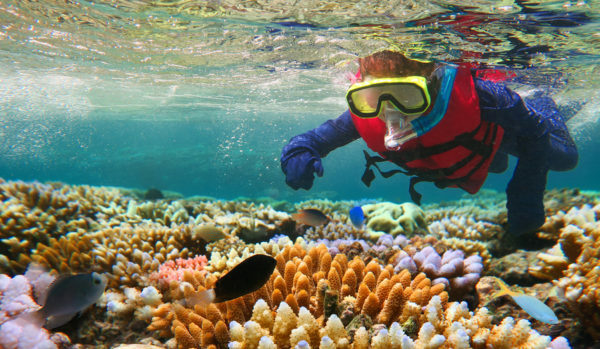 Great Barrier Reef Marine Park Authority chairman Russell Reichelt said the reef had experienced significant and widespread impacts over the last two years. “The amount of coral that died from bleaching in 2016 is up from our original estimates and … it’s expected we’ll also see an overall further coral cover decline by the end of 2017,” he said in a statement on Monday. Surveys by the Marine Park Authority, Queensland Parks and Wildlife Service, Australian Institute of Marine Science and the ARC Centre of Excellence for Coral Reef Studies found the most severe bleaching north of Port Douglas. There, an estimated 70 per cent of shallow water corals had died along with significant variability between and within reefs. It’s now confirmed about 29 per cent of shallow water corals died from bleaching during 2016, up from the previous estimate of 22 per cent, with most mortality occurring in the northern parts of the reef. Coral bleaching was also found in corals beyond depths divers typically survey but mortality could not be systematically assessed. However, a strong recovery in the south in the absence of bleaching and other impacts occurred during the same period. Officials are predicting further coral loss this year, resulting from the second consecutive year of bleaching and the impacts of tropical cyclone Debbie. This is in addition to the ongoing impacts from crown-of-thorns starfish, coral disease and poor water quality from coastal run-off. Over the past few months bleaching had occurred in a similar pattern to last year but was most severe between Cairns and Townsville.